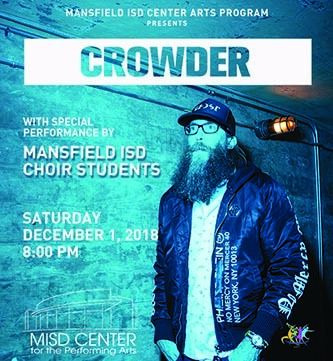 Grammy-nominated contemporary Christian artist Crowder will perform at The Mansfield ISD Center for the Performing Arts on Saturday, Dec. 1 at 8 p.m. as part of his national “American Prodigal” tour. The concert will feature performances from MISD choir students as the opening act. Proceeds from the event will go toward the MISD Center Arts Program, which brings in art performances and cultural events to MISD students and the community. Crowder, a Texas native, began his musical career as the lead vocalist of the David Crowder Band in 1996. The group experienced a tremendous amount of success with sixteen singles, six studio albums, two live albums and a compilation CD. In 2012, Crowder launched his solo career. His debut solo studio album, “Neon Steeple,” was released in May of 2014 with the first single, “I Am,” charting at number three on the Billboard Christian Songs chart. For more information about the concert, visit center.mansfieldisd.org or call 817-299-1230.